November 30, 2011 - Pilots for the regional airline CommutAir ratified their first-ever union contract on Tuesday, winning double-digit percentage pay increases, improved scheduling rules, more time off and other improvements. Champlain Enterprises, Inc., operating name CommutAir, is an American regional airline with its headquarters in South Burlington, Vermont and its operations center in North Olmsted, Ohio. It operates under the name Continental Connection for United Continental Holdings, with its main bases at Cleveland Hopkins International Airport and Newark Liberty International Airport. The 170 pilots of Cleveland-based CommutAir ratified a tentative agreement reached earlier this month by a margin of 78 percent, with 92 percent of eligible pilots casting ballots. The 48-month contract takes effect December 1 and will become amendable in late 2015. Over the duration of the agreement, current captains can expect average increases of 30 percent in their hourly pay rate with first officers seeing increases of approximately 38 percent. The agreement also includes many new ways for pilots to accrue pay, above and beyond their scheduled flying. ?We have pioneered a solid foundation that will benefit our members for years to come, and every agreement going forward will build on the success of this one,? said Capt. Jay Dougherty, chairman of ALPA?s CommutAir Master Executive Council. ?In addition to better pay, we will finally benefit from many of the provisions which have become standard at other pilot groups with long-standing union contracts, including block or better pay, defined discipline protocol and the ability to file grievances.? The CommutAir pilots unionized by joining the Air Line Pilots Association, Int?l. in 2008 and opened negotiations in February 2009. They entered federal mediation under the auspices of the National Mediation Board (NMB) in December 2010. ?I salute the CommutAir pilots for their unity and professionalism through three years of often difficult negotiations,? said ALPA President Capt. Lee Moak. ?Until today they were some of the lowest-paid turboprop pilots in the country. By deciding to join ALPA and then achieving this inaugural agreement, they have raised the bar for themselves and joined their counterparts in the industry by gaining the protections of a contract.? CommutAir pilots, who fly under the United Express banner, operate Bombardier Q200 and Q300 turboprop airliners from bases in Cleveland and Newark. 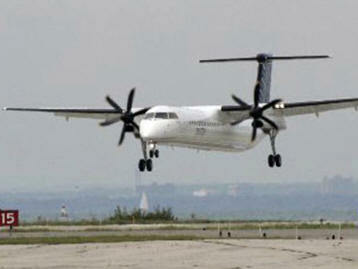 In May of 2011, CommutAir began adding 5 Bombardier Q-300 Dash 8 aircraft to their fleet. Two of the aircraft are allocated to Cleveland services and 3 aircraft are allocated to Newark services.